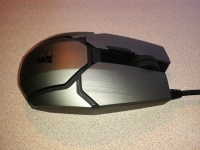 The aesthetics of the Tesoro Gandiva H1L laser gaming mouse are definitely unique and impressive. The body may be made of plastuc, but it looks like it is constructed of multiple panels of brushed metal. The two mouse buttons, the palm rest, and the sides of the mouse near the palm rest all have this metallic finish, and even the manner in which they are 'cut' resembles metal work more than it does plastic molding. The top of the mouse features the two usual buttons and the scroll wheel, two smaller balck buttons for DPI adjustment, a bank of LEDs that indicate which DPI setting you have selected, and on the plam rest we see the somewhat sinister face from the Tesoro logo. 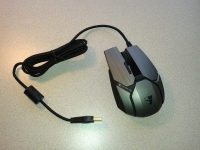 When in use, various areas of the mouse light up thanks to LEDs in the body, and you can even change the color visible in places like the scroll wheel and the back lighting for the face from the Tesoro logo. Zooming in on either image below provides a good look at the brushed metal finish found on the Gandiva H1L. 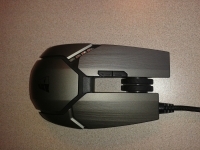 The below left image also shows the bank of four LEDs just behind the left mouse button... These illuminate to indicate which of the 5 DPI settings you have selected by use of the two black buttons on the left mouse button near the center of the device. 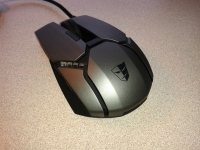 I have used mice with four DPI settings, but five is something new for me. While I can typically get away with 2-3, having fuller coverage of the possible range is a good thing. 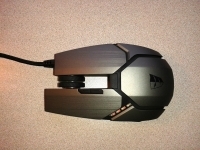 The below right image looks at the mouse for the right side, and you can see that the scroll wheel is fairly high profile. 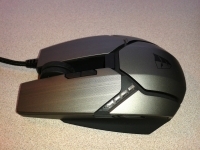 Additionally, the scroll wheel is grooved down the middle and has a grippy texture... Both of which helped to keep my finger in place and able to actuate the wheel very well. 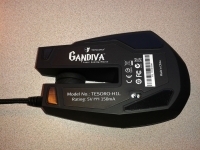 The next two images provide a straight down look at teh Gandiva H1L. Note that the left mouse button is longer than the right mouse button - and perhaps of more interest is that the center of the body is hollow. The scroll wheel is suspended between the two buttons, and you can see through to the desk on either side of it. Definitely a cool design concept! The next image takes a look at the mouse from the palm rest end, where you can also sort of see the two side buttons on the left side of the mouse. I found these buttons were a bit akward to press intentionally, and that on occasion I would press them inadvertantly, and usually either go forward or backward in my web browser. I would create a program for these within games, but for every day use I would remove any function from these buttons. The below left image shows the bottom of the mouse where you can see the unique shape created by having the area around the scroll wheel but out. Also of interest is the position of the laser / sensor, which is way back toward the palm rest and off to the right side of the mouse. I have never noticed this configuration before. One other thing to note on the bottom of the Gandiva H1L is that there is plenty of gliding surface applied. You don't just have dots of gliding material at the four corners, but a far more significant coverage. 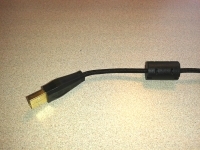 The above right image shows off the end of the USB cable. It is well finished with a braided sheath, gold plating on the USB connector, and a ferrite choke to reduce any potential electrical interference.